Former University of Cincinnati police officer Ray Tensing appears at Hamilton County Courthouse for his arraignment in the shooting death of motorist Samuel DuBose, July 30, 2015, in Cincinnati. A University of Cincinnati police officer who shot a motorist after stopping him over a missing front license plate pleaded not guilty Thursday to charges of murder and involuntary manslaughter. Twenty-five-year-old Ray Tensing appeared at his arraignment wearing a striped jail suit, with his hands cuffed behind him. He was indicted Wednesday in the July 19 shooting of 43-year-old Samuel DuBose, of Cincinnati, during a traffic stop. People in the courtroom audience erupted into cheers and clapping when bond was set at $1 million, drawing the ire of Common Pleas Judge Megan Shanahan. Prosecutors had asked for the $1 million bond. Shanahan rejected the defense's contention that Tensing wasn't a flight risk. Tensing is due back in court Aug. 19. 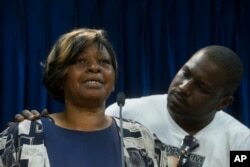 Audrey DuBose, mother of Samuel DuBose, is comforted by her son Aubrey as she speaks to the media after murder and manslaughter charges against University of Cincinnati police officer Ray Tensing were announced. DuBose's family has urged the community to remain calm, as it has in a series of demonstrations since the shooting. Tensing had stopped DuBose for a missing front license plate, which is required in Ohio but not in neighboring states. DuBose's death comes amid months of national scrutiny of police dealings with African-Americans, especially those killed by officers. DuBose was black; Tensing is white. Authorities so far have not focused on race in the death of DuBose. City officials who viewed video footage from Tensing's body camera said the traffic stop shouldn't have led to a shooting. "This officer was wrong,'' Police Chief Jeffrey Blackwell said Wednesday, adding that officers "have to be held accountable'' when they're in the wrong. Hamilton County Prosecutor Joe Deters scoffed at Tensing's claim that he was dragged by DuBose's car, saying the officer "purposely killed him.'' Using words such as "asinine'' and "senseless,'' the veteran prosecutor known for tough stands on urban crime called it ``a chicken crap'' traffic stop. Tensing, who was jailed overnight Wednesday, was fired soon after the indictment was announced. He had been with the University of Cincinnati for more than a year after starting police work in 2011 in a Cincinnati suburb. He also had earned a UC degree in criminal justice. Tensing's attorney, Stewart Mathews, said that he was shocked that his client was indicted on a murder charge and that Tensing did not intend to kill DuBose. Tensing, who could face up to life in prison if convicted, has said he thought he was going to be dragged under the car and "feared for his life,'' Mathews said. "With the political climate in this country with white police officers shooting black individuals, I think they need somebody to make an example of,'' Mathews said. Authorities have said Tensing stopped the car and a struggle ensued after DuBose failed to provide a driver's license and refused to get out of the car. "I didn't even do nothing,'' DuBose can be heard telling Tensing. DuBose held up what appears to be a bottle of gin. Tensing fired once, striking DuBose in the head. Aubrey DuBose, the victim's brother, called the shooting "senseless'' and "unprovoked.'' He said the family is upset but wants any reaction to the case to be nonviolent and done in a way that honors his brother's style.